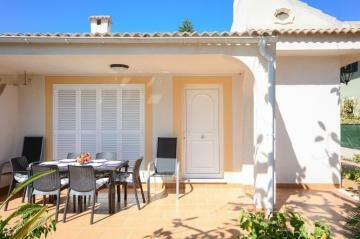 Welcome in this lovely holiday house in Puerto de Alcúdia! If you love the beach and the sea, this house is the right place for you. The house has 105 m2. It has 3 comfortable bedrooms with wardrobes and one bathroom with shower. There is one bedroom with a double bed, one with 2 single beds and another one with a bunk bed, perfect for 2 children. We are pleased to supply fans on request.The living room invites you to sit down on the sofa and relax. The kitchen is fully equipped: toaster, coffee machine, gas stove, fridge with freezer, cutlery, plates and much more. Furthermore, there’s a washing machine, an iron and ironing board.The front terrace has 20 m2 and it is furnished with a table and 4 chairs. Our guests love to have a coffee break here! The garden is located on the backside of the house and it is just perfect for a barbecue with friends or to bask in the sun – there are 2 sun loungers.The location of the home is perfect because you can reach the supermarket, restaurants, shops and the bus station in a few minutes’ walk. The fine grained sand beach is very close and the crystal clear water invites you to have a nap! Families with children love this beach, because the swell is moderate.The old town of Alcúdia with its little cobbled streets is a must see. Visit the old squares, the church and the town walls where you can also walk around the top of the old town. On Tuesday and Sunday there is market day in Alcúdia and the town turns into a busy place with lots of people. Don’t forget to visit the Roman Ruins including a villa, a bull-ring and an amphitheatre.Pets are not allowed.Distances:Airport: 55 kmSand beach: 200 metersSupermarket: 300 metersPuerto de Alcúdia (Ferry): 2 kmBus stop: 50 metersPharmacy: 1.1 kmBank: 500 mRestaurants, bars, shops... 150 metersTourist license: 6312There's a mandatory tourist tax in Balearic Islands, called Ecotasa. All guests, except people under 16 years, have to pay this tax. The amount varies between 0.55€/night and guest during the low season and 2.2€/night and guest during the high season and is reduced by half from the 9th day for your stay. Guests will receive an email 7 days prior to arrival with mandatory general deposit payment information. The deposit is payable by credit card via a secure link within 24 hours after receiving the email. For more details, please contact the office using the information on the reservation confirmation received after booking.